After upgrading to kernel version 4.15.0-29 from 4.15.0-23, the system logs are flooded whenever I move the cursor with my touchpad. I am currently running the older kernel version but would still like to be up to date without this flooding happening. I am having the same issue, sadly I have a fresh 18.04 install, so I cannot revert to an older kernel, let me know what I can do to avoid the issue, or help you find a solution. I think I've found a workaround for this issue, in my case adding 'acpi_osi=' to the linux kernel parameters solved it. I am running a Dell Inspiron 15 5577 (with latest BIOS, v1.1.0). Adding "acpi_osi=" to GRUB_CMDLINE_LINUX_DEFAULT fixed the issue for me on my Dell Inspiron 15 7559. Thanks for this solution! Hi Joseph, thank you for building a test kernel. I have installed it on my machine and it booted successfully. However, the bug still persists without "acpi_osi=" added to GRUB_CMDLINE_LINUX_DEFAULT like before. To make sure I was running your test kernel, I ran uname -v and it returned #35~lp1784152. I guess that parameter puts the touchpad into PS/2 mouse mode. Can you check if "i2c-hid" is loaded via `lsmod`? This is happening to me too on an Acer Aspire 5 A515-51G-515J. Adding "acpi_osi=" to GRUB_CMDLINE_LINUX_DEFAULT left me without a trackpad (it eliminated the log messages too, of course!). it was solved when i changed on BIOS the Touchpad option from Advanced to Basic Features. as the user Keith Brown. When Adding "acpi_osi=" to GRUB_CMDLINE_LINUX_DEFAULT left me without a trackpad. > Can you check if "i2c-hid" is loaded via `lsmod`? i2c_hid is indeed loaded when I run lsmod. Seeing it also on my Acer Swift 1 laptop with the newer Ubuntu 4.15 kernel releases (newest as of this writing is 4.15.0-35-38, and the issue is present in that build) and also with the mainline 4.18.10 release. My touchpad is also an Elantech, but is a different model from the original report. My touchpad is reported as ELAN0501 instead of ELAN1010 in the dmesg spam, but otherwise, it's exactly as reported (also reporting 14/65535). Changing the touchpad mode to basic in the UEFI does eliminate the dmesg spam, but that's because it switches it to PS/2 mouse emulation mode, no longer using the I2C bus at all. The acpi_osi= parameter disabled the touchpad when I tried it. Please attach `udevadm info -e`, thanks! Please boot without any kernel parameter and load i2c-hid, then rerun the command, thanks! I have installed your kernel build and removed all kernel parameters but it unfortunately didn't fix the issue. Because I only added ID for Ascaris's device. I have HP Elitebook 850 G5 and I'm experiencing this issue too. Here is my udevadm info -e.
I installed the kernel as linked in post #18. It installed without a problem and booted and ran on the laptop just like the official kernels. I've confirmed it is 4.19.1 running. Note that the 14/65535 from the previous kernels has changed to 64/65535. I don't have any idea what the significance of that is, but it's a change. Do you need another udevadm report for this kernel too? I will be happy to provide one if it will help. That means the workaround (increases the input length to 64) that works for me doesn't work for you. kdanilov, is it possible for you to file a separate bug? Precision 7730 should use ALPS touchpad instead of ELAN touchpad. I think an update fixed this for me, the log flooding have not happened now for 24 hours. Can anyone else confirm this. Ubuntu 18.04 fully updated - No steps was taken to fix this from my side. I just updated my system (sudo apt dist-upgrade), and still having the issue, latest kernel didn't fix it for me. I am attaching the ``udevadm info -e`` for Dell Inspiron 15 5577, without any boot kernel params set. Niel, it's still happening on my system as of now (October 10, 2018), using latest Ubuntu kernel. Did you change the touchpad to basic mode by any chance? Ascaris, I did no action to solve the problem. I received my new Dell laptop, was busy setting up my ubuntu 18.04. Started to work found my laptop Hard drive was always busy and sluggish. 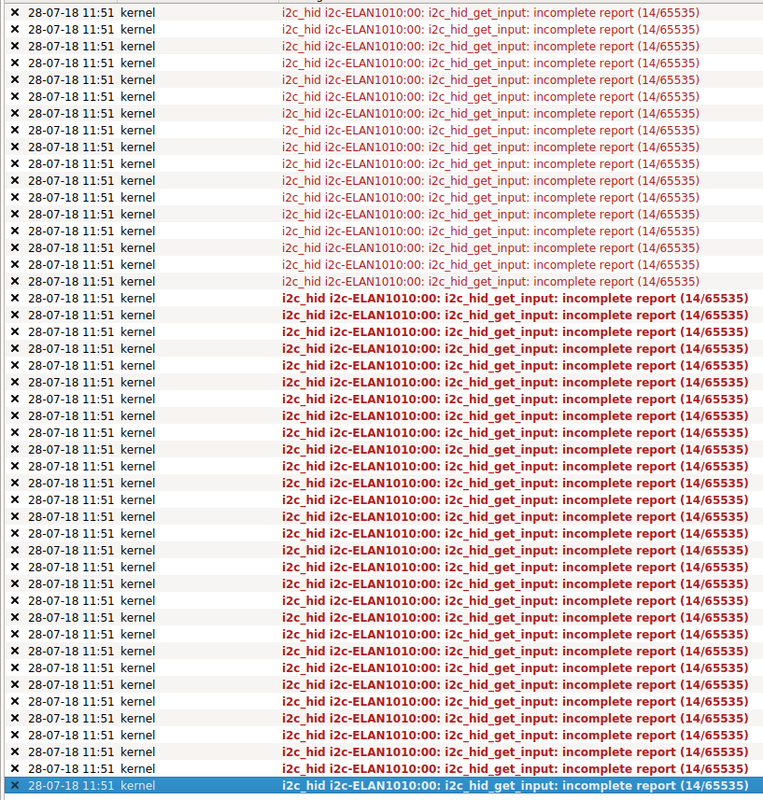 After few days I found the problem, the syslog was huge with thousands of the above messages. I decided to start the steps the next day to try to solve the problem, but the next day there were no messages anymore. So the only explanation was at that stage that an update fixed it. Not sure if I can do anything on my pc to help you with your tests on the problem. Ascaris, Just an idea I did changes to the touchpad settings at that point also. Not sure if that was the reason the messages stopped. 1. Switch off "tap to click" in the Ubuntu touchpad settings. 2. Used the Gnome tweaks tool to switch on the right button on the touchpad. "Mouse Click Emulation"->"Area, Click the bottom right of the touchpad for right click and the bottom middle for middle click"
I stand corrected my syslog is now already 800 Mb flooded by the above error. My problem is not solved. Just to document my steps. 1. My normal day to day I use a mouse connected to the computer. From above the problem sound to be originating from the touch-pad. 2. This weekend I used the pc on touch-pad for an hour, and just closed the lid. 3. Monday morning I opened the lid and on wake up the flooding is in process. 4. After restart the flooding stopped. If I am correct it sounds like if I don't use the touch-pad the flooding don't happen. No steps was done from my side. I attached my "udevadm info -e" for my Dell Inspiron 3576. If "incomplete report" gets spewed when using the touchpad, it can be similar to . If the "incomplete report" floods after S3, it's a different issue, please file new bug for it. I'm having the same issue with my Mi Notebook Pro (I'm using debian buster with 4.18 kernel). To fix that I compiled the i2c-hid module replacing dev_err with dev_err_once - so I still can see the "incomplete report" but only once and not 20 times per second (during sliding finger over the touchpad). Of course it fixes the problem only if the error message is identical(!) as it was in my case. I have this issue too - it's on a Dell Inspiron 7373. If there is anything I can do to help debug, please let me know. Kai-Heng - just tried out that kernel and that looks like it stops the issue for me here - thank you. Your touchpad should be Alps instead of Elan. I have same problem with Dell Latitude E7480 with attached dock station (without station I haven't the bug). I have a similar workaround as Rekby, only as a pm-action hook. records in my logs per second than I cared to count. adding 'acpi_osi=' to GRUB_CMD_LINE_DEFAULT only seemed to succeed in disabling my trackpad, so i quickly undid that. I applied rekby's solution, put the machine to sleep a few times, and so far haven't seen the issue rear it's ugly head. If it turns out that I need to apply lscotte's solution for this particular dell model I'll post again to let folks know. Same bug on an Acer Aspire ES 15. I found a solution by changing the touchpad BIOS value from "advanced" to "standard". Same bug on Dell Precision 3530 laptop. BIOS on Dell 3530 does not offer touchpad settings. changing dev_err to dev_err_once like suggested in comment 35 worked for me, thank you! I've been having this same issue on my HP Envy. Rekby's workaround appears to have solved my issue - thank you!! Problem persists even after Rekby's workaround. Rebooting has no affect, so my issue has nothing to do with suspending/sleeping my pc. Also tried acpi_osi="" in grub. This only disables my touchpad. Workarounds with driver recompilation are not really a good fit in my case since they require to set up a build system and also to enroll a MOK key for unsigned drivers to work because I have Secure Boot enabled. acpi_osi workaround disables touchpad on my system. You can make the filter more specific, i.e. filter only "incomplete report" messages instead of suppressing all output of messages containing "i2c_hid_get_input" but latter case works just fine for my purposes. That's a good point but unfortunately unloading and reloading the module doesn't stop the messages from being produced on my system. Also, until the issue is fixed, my aim was exactly to filter unnecessary events from syslog to avoid bloated log files (kern.log and syslog) and unnecessary events since it was the biggest and probably the only real symptom for me. This way logs are still forwarded to syslog where i2c_hid messages are filtered by the blocklist config file but you lose the ability to monitor logs using e.g. journalctl. I would like to emphasize that this is a temporary solution which works pretty well for my purpose but might not be a good fit for others. Please try to work around this behavior on kernel driver level first before resorting to syslog/journald shenanigans. Eagerly looking forward towards a fix for Elan touchpads. Once the SRU  has completed, the issue should be solved. Same issue here with a Dell inspiron 7373, I can see the trash messages in the virtual terminals after recover from suspend making them useless. Issue is fixed by kernel version 4.18.0-16 on my Elan touchpad ELAN0501 04F3:305B touchpad. Selecting 4.18.0-15 brings the issue back, so I can confirm it was in the kernel and not another update. It doesn't flood logs, however i2c kernel threads consumes a lot of CPU. Only module reload is helpful. Please don't close this bugreport! Do you have this issue after S3? This issue generally happens to platforms that default to use s2idle but S3 is in use. BIOS doesn't turn off the touchpad power during S3, hence the IRQ gets pulled up. So I suggest use s2idle, or ask the platform vendor to solve the issue from BIOS. Yes problem appeared 2 times right after suspend, but not after every suspend. (basically I'm not fluent what suspend mode is in use, I just closed laptop lid to suspend and opened it back next day or after a hour. During all that time laptop was suspended without external power source). Power source was connected via external thunderbolt hub. I can contact platform vendor, but could you please clarify what exactly should I ask them? Use `cat /sys/power/mem_sleep` to check. Ask them to disable touchpad completely during suspend.